Sakai Guides and DocumentationSakai Complete User Guide Site InfoHow do I hide or show items in the Tool Menu? The Tool Menu can be customized by instructors or site administrators to modify the appearance of menu items in the site, including hiding or showing tools to site participants. Hide a tool from site participants. Click the cog icon to the right of a visible tool. Select Make Tool Invisible to Students. Hidden tools display for instructors and site administrators in italics, in light gray, with an eyeball with a slash icon (Hidden from site members). In the example pictured above, the instructor sees several hidden tools, while students do not. To organize activities and make it easier for students or site members to access site content, you can use visible tools in your site, such as Lessons, to link to or embed items from hidden tools. For example, if you hide the Resources tool in your site and upload an article PDF to Resources, you can create a lesson page nd use the Add Content Links option to link to the article and make it available to students. You can also embed images on pages using the Rich-Text Editor. The Tests & Quizzes tool must be visible to make feedback available to students; Tests & Quizzes feedback cannot be accessed via links in other tools. The Site Info tool must be visible to use joinable groups; students or site members join groups via the Site Info page. Pictured above is a site's Tool Menu and lesson page, where Resources is hidden. The lesson page includes an embedded image which is stored in Resources. Pictured above is the instructor's view of the Tool Menu with hidden tools and the image file's location in Resources. 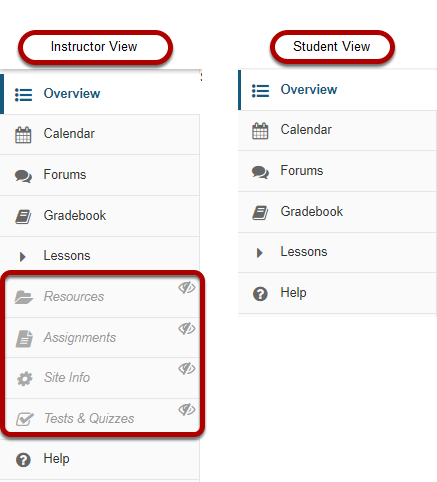 The instructor has hidden Resources so that students will not be confused about where to find course materials - lesson pages with embedded and linked content guide students to specific tasks. Show a currently hidden tool to site participants. Click the cog icon to the right of a hidden tool. Select Make Tool Visible to Students. Lock access to a tool. Tools can be locked so students or site members cannot access ANY content in the tool. Locked tools display on the Tool Order page with an eyeball with a slash icon (Tool is hidden from normal users) AND a lock icon (Tool is disabled for normal users). Click the cog icon to the right of a tool. Select Lock Access to this Tool. Prev: How do I remove a tool from my site?